Why should I trust my SWAT vehicle needs to you? A SWAT vehicle for sale in our inventory promises to be versatile and offer state-of-the-art design and engineering. Choose from SWAT assault vehicles, armored trucks, armored vans, armored car transport, police cars, Suburbans, and more. There is a reason ours are the most sought after SWAT special vehicles on the market today. Don't wait another minute to add a SWAT special vehicle to your arsenal. Learn more about how we can help you today. When we offer a SWAT vehicle for sale, we're offering top of the line models that set the industry standard. From SWAT assault vehicles and armored transport to police cars and Armored Suburbans, we have a model that's right for you. 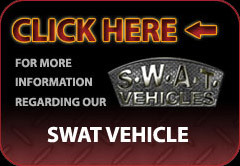 Learn more about our SWAT special vehicles and how they an address your police tactical needs. We have many a SWAT vehicle for sale, and we invite you to discover the make and model best for you. Our products include SWAT assault vehicles, armored trucks, armored vans, and a host of other great choices. If you're in the market for a SWAT special vehicle, we promise you've come to the right place.